1. 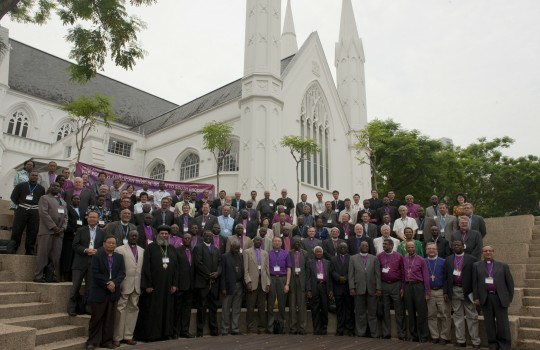 The Fourth Anglican South to South Encounter took place in Singapore from April 19th through April 23rd, 2010. The theme for this encounter was: “The Gospel of Jesus Christ - Covenant for the People; Light for the Nations.” We marveled at the power of this Gospel as we met together from all corners of the globe united in our commitment to Jesus the Christ and the proclamation of His message of eternal assurance and transformation open to all people. We were renewed in our determination to assist each other in fulfilling the Great Commission to make disciples of all nations and to do all that Christ has commanded. 2. Grateful for the gracious guidance of the Holy Spirit a total of 130 delegates from 20 provinces in the Global South (Comprising Africa, West Indies, Asia and South America) gathered together. We represented the vast majority of the active membership of the Anglican Communion. We were also joined by a number of our partners in the Gospel from Australia, New Zealand, and the USA. The entire delegation from the Province of West Africa and invited participants from the UK and Ireland were unable to be present because of travel difficulties. 3. We were immensely grateful for the wonderful hospitality provided for us by Archbishop John Chew and the people of the Diocese of Singapore and, in fact, the entire Province of South East Asia. The ministry among us by the former Primate of South East Asia, the Most Rev’d Datuk Yong Ping Chung as Encounter Chaplain was also a source of great blessing. The warmth of their welcome and hospitality provided a context in which we were able to pray, study, worship and take counsel together so that we might more clearly discover a united and prophetic voice about matters that affect our beloved Anglican Communion and our world. 4. We gave thanks to God for the visionary leadership of the Most Rev’d Peter J. Akinola, recently retired Primate of the Church of Nigeria (Anglican Communion) as Chair of the Global South Primates Steering Committee for the past ten years. We welcomed the election of the Most Rev’d John Chew as the new Chairman, the Most Rev’d Henry Orombi as Vice-Chairman, The Most Rev’d Mouneer Anis as Secretary, the Most Rev’d Nicholas Okoh as Treasurer, and The Right Rev’d Albert Chama and the Most Rev’d Stephen Than as members. 5. We were encouraged by the warm welcome given to the Primates at the Istana (Presidential Palace), by the President of the Republic of Singapore, His Excellency Mr. S.R. Nathan. Singapore is a rich multi-cultural tapestry that provided great encouragement for us to have eyes to see clearly the various people groups in our own nation’s context of ministry. 6. We were appreciative of the greeting given by the Archbishop of Canterbury, Dr. Rowan Williams, by means of a brief video that was shared at the beginning of our time together. We rejoiced in the welcome given to us by Elder Fu Xianwei, Chairman of the National Committee of the Three Self Patriotic Movement (TSPM) of the China Christian Church and the presence and warm greeting offered by His Grace Bishop Suriel representing His Holiness Pope Shenouda III of the Coptic Orthodox Church. 7. We met under the shadow of a serious global ecological crisis as a volcanic ash plume from Iceland resulted in a massive disruption of international air travel. We were reminded yet again of the fragility of our earthly existence and our utter dependence upon the grace of God for life itself. 8. We were mindful of the many difficulties confronted by the nations that we represent. These include natural disasters that have led to enormous devastation, deprivation and the loss of life, political instability that has too often resulted in corruption and violence and the ever-present challenge of living in a world of multiple religions and competing truth claims. We are grateful for those many places where it is possible to live out and promote our Christian convictions without threat but we know that this is not the experience of all our members and we honor those whose Christian faith has led to their marginalization, persecution and sometimes their violent deaths. We uphold all of them in our prayers. 9. We received presentations on the Gospel of Christ, mission and ministry from the Nigerian, West Malaysian and Ugandan settings. Huge political, social and economic changes are taking place as we begin the 21st Century. The global shift in Christian demography brings with it new opportunities for evangelistic outreach. However, we also need to understand afresh the challenges that are confronting the Church and the wider society. We encourage Provinces to develop intentional plans and structures for Church growth in the post-Christendom context of today’s world. Above all, we call for a new quest for personal and corporate holiness in the Communion. 10. We responded positively to the call to declare the next ten years a Decade of Mission and Networking and urge our respective Provinces to take up the matter, especially in expanding mission sending capacity to enhance networking among Global South Provinces. We call upon our Churches to pay greater attention to the role of Christian professionals in the mission, ministry and witness of the Christian community. We also need to pay particular attention to the pastoral needs of the laity, especially women and young people, who are witnessing to their faith at the cutting edges of mission. Networking and increasing active engagement of both public and private sectors in improving the economic livelihood of local communities. 12. The youth leaders from the Provinces of Egypt, Nigeria, Kenya, Uganda and Southeast Asia met together to celebrate their Anglican heritage. We agreed that the future of the Communion lies in winning the next generation for Christ. We urge each region to adopt initiatives to better understand the needs and characteristics of this new generation so that we might better communicate the Gospel and Christian values to them. It is essential that the ethos and traditions of the Church be imparted to the youth in creative and dynamic ways so that they will be equipped to live for Christ for their generation and beyond. 13. During our plenary sessions, bible studies and small group discussions we were called back to a fresh vision of God, of the Church and of Christian leadership. We saw God in His stunning holiness and absolute sovereignty through Isaiah’s vision (Is 6: 1-13), and correspondingly saw our own ingrained sinfulness and utter foolishness in trusting man rather than God alone. We caught a “ big” vision of the Church from her role as ‘servant of the Lord’ (Is 42: 1-9) to bring God’s justice or ‘right order of living’ to the nations of the world. This established the absolute necessity and priority for the Church to disciple her members under the authority of the inspired Scriptures so that they may transform their societies and reach the nations with the Gospel. The fresh call upon the Church’s leadership, from the Servant of the Lord’s costly obedience (Is 50: 4-9), is to be courageous and fully confident of the Lord’s sustaining grace and final vindication. 14. Upon this biblical foundation, we looked afresh at the theological underpinnings of the Encounter’s theme, found renewed strength to pursue its practical outworking and renewed our commitment to network with one another for mission, prayer and economic empowerment strategies so that we might enlarge the capacity of our provinces and dioceses to fulfill the Great Commission. 15. As a sign of our fellowship and an encouragement to our purpose, at the beginning of our assembly God sent into our midst two Nepalese Anglicans, members of the new Anglican Church in this principally Hindu and Buddhist nation. They shared with us about new Anglican initiatives that are bringing the gospel to their people and the way in which the Word of God has brought life and hope and peace, along with suffering. We rejoice with them in their newfound faith and their determination to be obedient to the Word of God in a setting where such obedience is very costly. 21. Global South leaders have been in the forefront of the development of the ‘Anglican Covenant’ that seeks to articulate the essential elements of our faith together with means by which we might exercise meaningful and loving discipline for those who depart from the ‘faith once for all delivered to the saints.’ We are currently reviewing the proposed Covenant to find ways to strengthen it in order for it to fulfill its purpose. For example, we believe that all those who adopt the Covenant must be in compliance with Lambeth 1.10. Meanwhile we recognize that the Primates Meeting, being responsible for Faith and Order, should be the body to oversee the Covenant in its implementation, not the Standing Committee of the Anglican Communion. 22. Over the last 20 years we have been distracted by conflicts and controversies that have kept us from effectively fulfilling the Great Commission. While we have been so distracted, Christian heritage, identity and influence has continued to decline in the West. We believe that there is a need to review the entire Anglican Communion structure; especially the Instruments of Communion and the Anglican Communion office; in order to achieve an authentic expression of the current reality of our Anglican Communion.